On Jo Hovind & Karen Vernon! – Kent Hovind v. Robert Baty – The Great Debates! Home→On Jo Hovind & Karen Vernon! Kent Hovind sent his wife Jo Hovind to prison as assuredly as King David sent Uriah to his death. The subject of this article has come to my attention based on the fact that Kent Hovind’s man Rudy Davis has picked up on the old Vernon case in conjunction with his activism on behalf of Francis Schaeffer Cox. There seems to be a number of analogies that can be made between the cases of Lonnie & Karen Vernon and Kent & Jo Hovind. Lonnie & Kent had anti-government, sovcit issues. Lonnie & Kent had tax evasion issues. Lonnie & Kent had “jurisdiction” issues. Lonnie & Kent were married many years to submissive women. Lonnie & Kent were willing to send their wives to prison and did so. 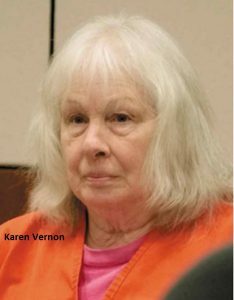 In the case of Lonnie & Karen Vernon, we are given some insight into Karen’s side of things via the reporting of the case and her participation in discussing her part in her husband’s schemes which led to her going to prison. 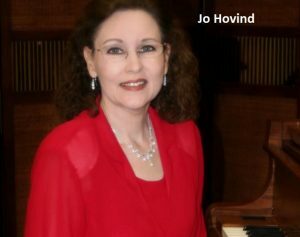 As far as I know, Jo Hovind has been well protected and kept in seclusion as far as any effort to tell her story openly and honestly. Maybe we will yet be provided an exposition from Jo regarding her history with Kent Hovind. Here is a link to an excellent article from the Vernon case, the sentencing, which includes a lengthy discussion of the case and Lonnie’s part of the proceedings, followed by the discussion of Karen’s sentencing proceedings. Today (January 7, 2013) is the sentencing for the Salcha couple accused of conspiring to murder a judge and his family, and IRS agents as they anticipated seizure of their home due to a tax dispute. Lonnie Vernon is also being sentenced for his role in the “2-4-1 Militia trial” with co-defendants militia leader Schaeffer Cox, and militia Major Coleman Barney. Lonnie Vernon plead guilty of conspiring to murder the judge in exchange for the dismissal of many of the charges against him. Of all the characters in this tale, Lonnie Vernon is the most volatile and angry, and Karen Vernon is the most sympathetic. It proves to be an interesting and eventful day, worthy of a scene in a Greek tragedy, or some epic Hollywood courtroom drama – one that is rated R for language. Next is the sentencing of Karen Vernon, and when I tell you that you could not have had a more completely opposite sentencing hearing, I really mean it. Karen Vernon, as I’ve said before, reminds me of the librarian that does reading time with kids, or a nice old lady who works in a yarn store, or the awesome grandma who bakes snickerdoodles when you come over because she knows they’re your favorite. OK, yes. She hocked jewelry to buy grenades, but to say that seems violently out of character is an understatement. The whole crew is back. Judge Bryan says he’s read everything filed in regard to sentencing and reviewed the plea agreement and the events of the trial. The maximum sentence under the guidelines is 235 months. “I hope it isn’t, and I assume so. That would be alright.” She looks meek, and sad. Gardner says he sees no conflict. Yvonne Lamoureux presents the opinion of the prosecution, and starts with the reliance on a psychologist’s report which concludes that she poses no risk of violence to the community. She states that the psychologist did not have factual evidence about the case that was relevant, and did not know what Vernon had admitted. “Those statements should have been taken into account in determining if she poses a danger to the community. Her own statements demonstrate the serious nature of offense – statements about killing federal officials. ‘We need to cure the lead deficiency’ of judges,’” – a reference to the good-bye letters to family and friends found in the Vernons’ truck. The prosecution concedes, “She worked hard, was a good member of society. Since she was incarcerated, she’s been a contributing member of the prison society.” Lamoureux goes on to say that taking all that into consideration warrants a sentence of at least 188 months, even given her history and her age. Vernon’s attorney Darrel Gardner is next, and references numerous letters of support for her. Bryan says he’s read them, including material from the prison. He urges the court to “look at the dynamic.” She’s been married to Lonnie Vernon for 30 years. He talks about couples who are very different from one another. “You marry a personality, but end up living with a character.” He asks the court to imagine what living with Lonnie Vernon must have been like, for 30 years. Now it is Karen Vernon’s opportunity to address the court. Bryan asks if she had something to say. Judge Bryan looks like he believes that, and I think everyone in the courtroom does. “Where is your mind regarding this whole income tax issue regarding Judge Beistline?” Bryan asks her. Bryan, looks at her, head in hand. He, like the rest of us, appears to be struggling with the schism between Vernon’s demeanor, and her husband’s – between who she appears to be, and what she has actually done. She pauses for a moment in anguish, weighing the question, and composing herself. “Who was going to give him work?” asked Bryan. Judge Bryan seems satisfied, and is ready to come to his conclusions. “Well, the law tells us to look at the nature of the offense and the history of the defendant and her characteristics. Let me talk about that latter thing for a minute. Before this all came up, Ms. Vernon was the salt of the earth. You couldn’t find a better person or a harder working person, as far as the case and the letters indicate. Since this happened the nature has come out with what she has done in the prison with the other inmates. It looks like what we have here is a good person who did a very bad thing. And that leads to the seriousness of this offense. This was a most serious offense, and it was a conspiracy that I’m afraid was well on the way to possible conclusion with horrible results. It may have been more your husband’s fault than yours, but that does not excuse you, and I guess in these days of women’s liberation, women are expected to speak with their own voice and not get dragged into things because of some guy, no matter how they feel about that guy. “In light of her age, there should be some modification of the guidelines, but not much. This is a situation where there are a lot of people in the community who think this never should have happened – that is, the prosecution should never have happened. But these things are part of our law, and what we recognize as important to live in an ordered society, so we don’t hurt each other. This offense was serious. “I’m not sure it’s of concern to deter Ms. Vernon from further offenses, but certainly any sentence should be sufficient to deter others form thinking they could somehow win by doing away with public officials whom they disagree with. Ms. Vernon is not likely to commit any further crimes, let alone a crime like this, …but the seriousness of this crime keeps coming back. “Is it 12 years from when I was first arrested?” Vernon asks quietly, but with composure. It was a day of extremes in personality, but both Vernons march forward into whatever the rest of their lives hold. They strike me each as people with a fatal flaw – his, a stubborn “you can’t tell me what to do” streak with a dash of heavy metals, and hers being a compliant small fish, trying to keep her life peaceful at the expense of good sense, and getting caught in a net larger than anything she could have imagined. In a video broadcast today by the Liberty Pastor Tim Coleman, he discusses at various points the Hovind situation, condemns Jo Hovind for her course, and gives Kent permission to look for other women to take Jo’s place if Jo doesn’t change and submit to Kent. The material in the video is a little dated, but it was just broadcast today. Jo appears not to have submitted to Kent and Kent gives indication that he is not only on the look for another woman but that Lady Di may be on his short list.